Easily mounts on top of an Upright to allow attachment of two parallel Drape Support Rods in any direction, including all four directions! For use with our 2 inch diameter Uprights only. 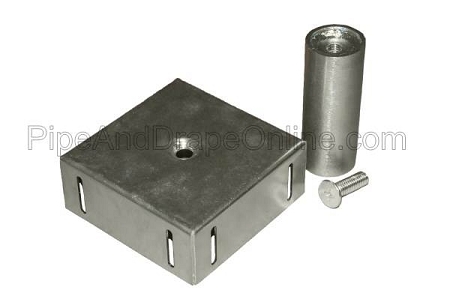 This will not work with 1.5 inch Diameter Uprights (please see our 1.5 inch version of this item). The top "box" portion measures approximately 4 inches x 4 inches. Each of the four sides features two slot cut-outs for Drape Support Rod hooks, spaced approximately 3 inches apart from each other. Please use no more than 15 lbs. of weight on any single Drape Support Rod being used. Quantity 1 = 1 Double Backwall Hanger. Pipes and other hardware sold separate. Only one Double Backwall Hanger can be used per Upright. 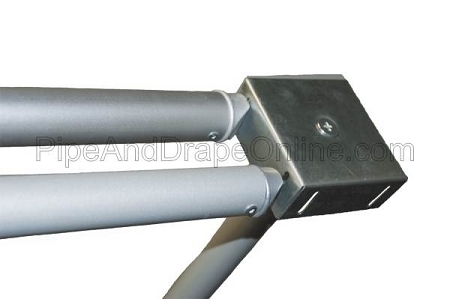 Remember that each end of the Drape Support Rod / Crossbar will need a Backwall Hanger to hook in to. Weight (Approximate, Each): 1 lb. 6 oz.